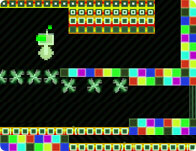 Get excited for this build it as you go race and jump platform puzzle! Collect stars but avoid the deadly dynamite, use power ups and build your own track as you go! Use your mouse to construct the track. Drag the ramps and jumps.